The Voodoo became the principle aircraft of the 98th Fighter Interceptor Squadron stationed at Dover Air Force Base in the mid-1950s to the mid-1960s. Their job was to defend Washington D.C. and the Eastern U.S. over the course of the Cold War. At any time the 98th was ready to scramble into the air within five minutes. In 1959 the 98th received the Voodoo , a versatile two-seat fighter. First designed at the end of WWII as a penetration fighter, it was adapted for close air support in 1954. For several years it was the fastest long range fighter in the arsenal. 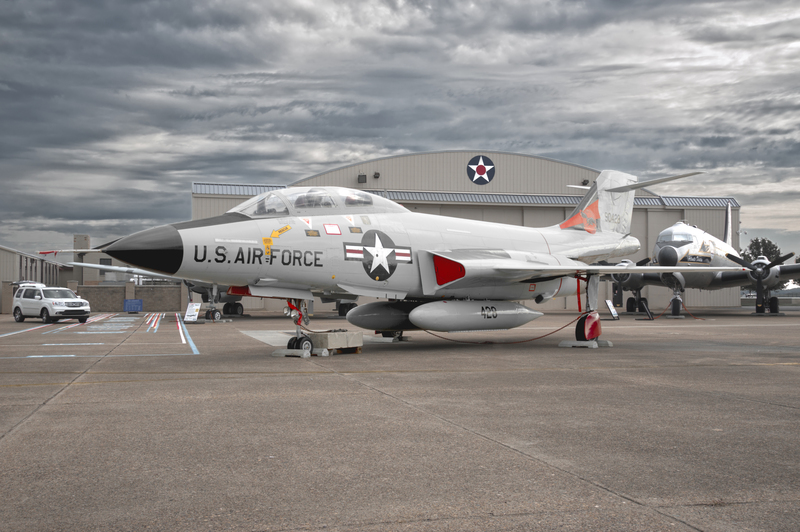 Our F-101 is displayed in the markings of the 98th Fighter Interceptor Squadron from Dover. 64-65-66- AVIONICS SHOP.–BEST TIME OF MY LIFE. Then Tsgt Thom Smith – I was supervisor of a Modica and a William Riles Who were Two of the best Electrical Technician that I have had the honor to work with. When you were a “F101 Voodoo Medicine Man” you had reasons to be proud. I was with the 60th FIS from 1964 to 1968 at Otis AFB, Cape Cod, Mass. I was a Voodoo Medicine Man as a weapons control system mechanic. It was during that period when the lightning Bolts were painted on the tail and the diving crow was painted on the fuselage. Loved the F-101B. Best years of my life. Worked on this aircraft from 1965 to 1967 for the 49th FIS at Griffiss AFB, NY. Our commander was Col O’Conner, and my time there was a great experience.